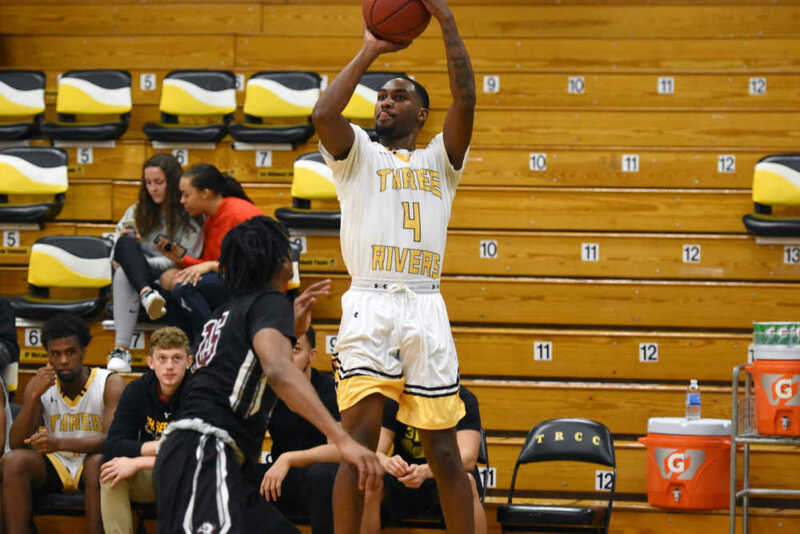 After a year of Division I basketball at Kennesaw State, sophomore Tristan Jarrett has seen a huge leap in his production since transferring to Three Rivers. In 12 appearances last season for Kennesaw State, Jarrett averaged 4.8 points per game. Since moving to Three Rivers, where he has taken on a role as the team’s primary scorer, ball handler and distributor, Jarrett’s scoring average has skyrocketed to 29 points per game, the highest average in the country. 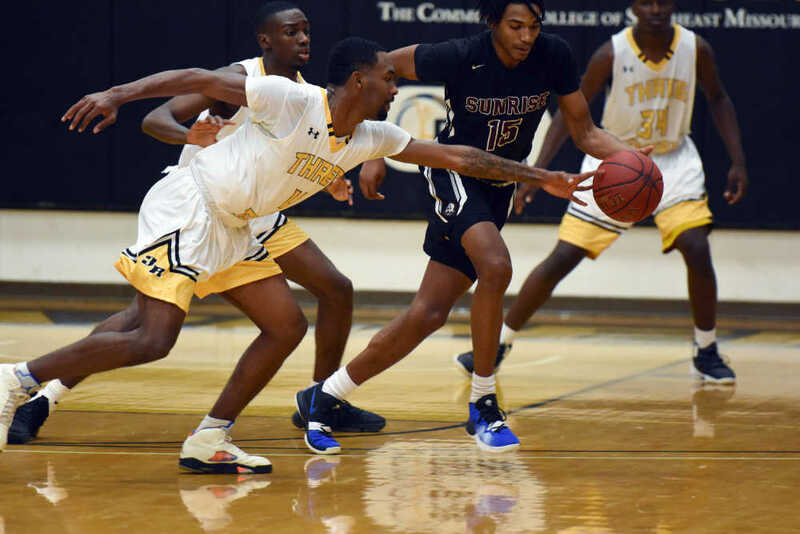 Jarrett said the biggest difference is having the ball in his hands and being able to play to his strengths, which helped him evolve into one of the NJCAA’s top threats. Some of the allure that drew Jarrett to Three Rivers was his closeness with the coaching staff. He said they could help him get to where he wanted to be after his sophomore year is over. Now, four-year schools from the Sun Belt, Conference USA, American Athletic Conference and Mid-American Conference have shown interest in Jarrett in the midst of his lights-out year. In this Dec. 6 file photo, Three Rivers' Tristan Jarrett (4) shoots the ball as Sunrise Christian Academy's Blaise Keita defends him during a game at the Bess Activity Center. Jarrett does more than just score the ball, though. As of Jan. 11, Jarrett has led the Raiders in rebounds (7.5), assists (5.5), steals (2.8) and blocks (0.9) per game. Three Rivers assistant coach Bryan Sherrer, who handles the scouting and recruiting responsibilities, always saw the potential in Jarrett. The Raiders tried to land him when he was finishing his high school career at Haywood High School in his hometown of Brownsville, Tennessee, before he made the decision to play his first year at Kennesaw State. ESPN listed him as a three-star recruit out of high school. Once Jarrett arrived at Three Rivers and got comfortable in the Raiders’ system, his numbers exploded. In a 98-93 overtime loss to now No. 5 John A. Logan, Jarrett scored 44 points and grabbed 10 rebounds. His point total was one shy of the school’s all-time record originally set by Latrell Sprewell in the 1989-90 season. He followed up that performance with 37 points and 13 rebounds two days later against Sunrise Christian Academy, which earned him NJCAA Division I Player of the Week honors. Facing top-tier competition serves as a motivator for Jarrett to elevate his game to the next level. In this Dec. 6 file photo, Three Rivers' Tristan Jarrett, front, reaches for the ball during a game at the Bess Activity Center. Playing in Region XVI means Jarrett has to face another top scorer in Moberly Area’s Alonzo Verge. Currently, Verge sits just behind Jarrett in scoring average as the two are neck-and-neck for the top spot and will meet twice this season starting Sunday. Dating back to his high school career, qualities like his competitiveness stuck out to Sherrer and the rest of the Three Rivers coaching staff when they were recruiting him. If Jarrett finishes this season at the pace he’s going, he’ll be in the record books at Three Rivers. His current 28.3 points per game average would be the best scoring average in program history. Sprewell averaged 26.6 in 1990 before going on to average 18 points per game in his 13-year NBA career, so Jarrett already has good company.